Experience Theatre Project, Beaverton’s only resident professional theatre company, proudly presents its 3rd annual pay-what-you-will summer production of The Taming And The Shrew: A #TimesUp/#MeToo Adaptation of William Shakespeare’s play. 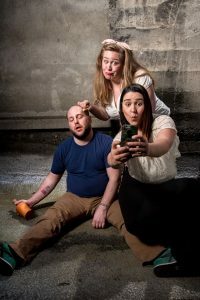 The play opens at 7pm on July 6, 2018 on the Beaverton Public Library south lawn, and will perform at the Library lawn on Saturday and Sunday, July 7-8 at 2pm, then again the following weekend, Friday, July 13 at 7pm, and Saturday-Sunday, July 14-15, at 2pm before embarking on an outdoor “wine tour” of Washington County wineries, concluding its tour in Yamhill County, at Stoller Vineyards, on August 12. MORE INFORMATION: All shows are pay-what-you-will – a $10 donation per person encouraged. All shows are all ages. No outside alcoholic beverages permitted at any winery location. People are encouraged to arrive early and bring low back chairs and picnics to enjoy this outdoor play at all locations. Umbrellas and shade canopies permitted at library lawn location. Parking and space is limited at winery locations. We encourage making advance reservations at ETP’s website for winery dates to ensure seating. Online reservations available for a donation; free tickets available as space allows each weekend. Ticket availability at wineries will be updated on Theatre’s social media channels and at our website. All winery locations will include fundraising drawing opportunities, from hotel stays to special bottles of reserve wines from each vineyard. A full schedule, plus wine and food packages, and reservations may be made at our website starting May 20, 2018 at www.experiencetheatreproject.org. Taming And The Shrew stars Kaia Hillier, Michael C. Jordan, Eva Andrews, Catherine Miller, Colin Trevor, Kelsea Ashenbrenner, Emilie Landmann, and Jacquelle Davis. Directed by Sara Fay Goldman; costume design by Hannah Edelson; Set by Winston Bischof; fight choreography by Kristen Mun; and production manager is Chris Beatty. Artistic Director is Alisa Stewart. Mask & Mirror Wedding Auditions! Tony n’ Tina Return!